If you are new to camping, you may have discovered how important lighting is at night. Headlamps are effective for small tasks and walking around the campsite, but for cooking and meal preparation, sometimes you need more than a headlamp. We purchased the Coleman Retro Rechargeable Lantern, not only because it looked very nice, but it could be charged from 240v or 12v which was important to us. The night light is a nice touch – having a little glowing yellow light in your tent is handy should you wake up and need something. It casts enough light to provide some orientation in the tent but not enough to keep you awake. In the second year, we have noticed that it does not hold its charge for more than 1 night’s use (eg. 4-6 hours), even on low. We cannot charge it from our portable battery, as it does not hold any charge, so we have no choice to wait till we can get to a 240v socket. There is no gradual dimming to indicate that it’s running low. It will just switch off abruptly. You turn it back on, and it might stay on for another minute, and then off again. We have tried all options of draining the battery, and recharging for recommended time, but we now know we cannot depend on this lantern for more than 1 nights camping. Reading other sites, this appears to be a common problem. Considering how much it costs here in Australia to buy, I would look at alternatives. Feedback from readers on this product. 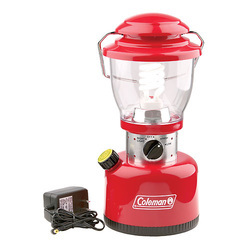 I've just read your review of the Coleman Retro Rechargeable lantern. We deal with your situation on a daily basis and your comments are fair to the extent that Coleman has neglected to include instructions with the owners manual which maximize life of the products. The lantern itself is probably one of the best fluorescent (and brightest) lanterns on the market. The drawback it has is the 'lead acid' rechargeable battery which Coleman (and most other manufacturers) use to run the lantern. Lead acid batteries like the be kept in a charged state. If not, the sulfuric acid inside the battery leaves a layer of sulfur on the lead plate which in turn does not allow as many electrons to stick to the lead plates as a clean plate would. The 'trick' is maintenance. If the battery has been discharged you must charge it up again as soon as you can. Unused batteries should be topped up every few months. Because this is not written in the owners manual, most owners use the lantern/discharge the battery then when they come home store the lantern for an extended period of time. This is when the damage to the lead plates occurs. When they decide to charge the battery (just before the next trip) the battery is usually next to useless. Lead acid batteries are used by most brands (Coleman, Primus, Oztrail etc.) including the Hot Water on Demand, Companion Aqua Cube, and when we sell an appliance that contains one we try to educate the customer in order to maximize product satisfaction. Unfortunately there are still Coleman retro lanterns being sold by 'big box stores' which have been sitting in their warehouses for over 4 years without having been re-charged. All this does is repeat your original comments on blogs, forums and around camp fires. Feel free to use this information to educate the readers on your blog.